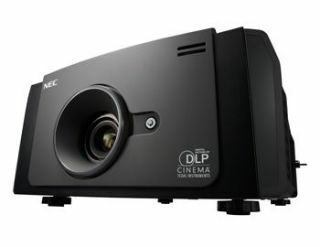 NEC Display Solutions of America is making available the NC1100L Digital Cinema projector, a laser-light source projector targeted to exhibitors with small screens or projection booths as well art houses, mobile cinemas, and theaters in universities and public buildings. NC1100L Digital Cinema projector, a laser-light source projectorThe NEC digital cinema projector will be demonstrated at CinemaCon 2014, the official convention of The National Association of Theatre Owners, running today through March 27 at Caesars Palace in Las Vegas, Nev.
As part of NEC’s Digital Cinema Projector Series, the NC1100L projector using a laser-light source delivers 2K DCI-compliant cinema quality, which translates to an image brightness of 14-ft-L (using a 1.8 gain screen) on screens up to 36 ft./11m in DCI color. It is the world’s first Digital Cinema-compliant projector with laser light source built-in. With user-friendly accessibility, the NC1100L projector features the industry’s first compact lightweight laser projector that is exhaust free for installation within the theater or projection booth. The NEC Integrated Media Server (IMS) offers a one-stop solution for exhibitors and other organizations, while the projector’s High Frame Rate (HFR) capability offers suitable picture quality. Its all-in-one Integrated Media Server (IMS) and 2TB RAID5 Storage Server offer versatile connectivity and savings with fewer peripheral devices needed. The NC1100L comes with a two-year limited warranty (for U.S. and Canada only), including parts and labor.